Preheat non-stick skillet over medium high heat. Place batter balls in skillet and press down with a spatula. Let them cook until the edges turn brown (2-3 minutes). Serve warm with sour cream, plain Greek yogurt, apple sauce or butter and maple syrup. 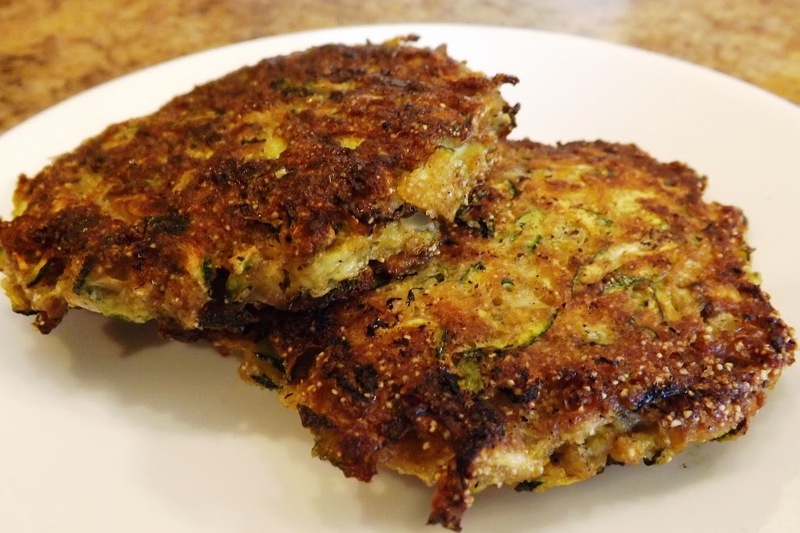 This is a great way to use all the zucchini your neighbors are trying to get rid of! Sounds good–I’m going to have to go see if my sister has some she doesn’t want. Do you know if it would work with one really big zucchini–that is usually what they have that they don’t want. Sarah, yes, you could certainly use one large zucchini. You need about 1 pound. The problem with large zucchini is the seeds. Since you are shredding it, that isn’t really a concern. I made them and they were delicious! I topped mine with some cheese and leftover pizza sauce and turkey pepperoni. I made portobella pizzas the other day and I have all kinds of pizza stuff left, so everything is a pizza! It was really good–I only fried up half the recipe, and will fry the others tomorrow. Hope they are still good tomorrow. The leftover batter should be fine if refrigerated. Your ideas sound excellent, Sarah! Thanks for sharing!